Texas A&M Aggies quarterback Johnny Manziel (2) rolls to the outside against the Missouri Tigers during the second half at Faurot Field. Missouri defeated Texas A&M 28-21. Texas A&M quarterback Johnny Manziel isn’t likely to win the Heisman Trophy again this season but at least he’s got a chance. The sophomore quarterback was one of six finalists invited to New York for Saturday night’s announcement of the winner. 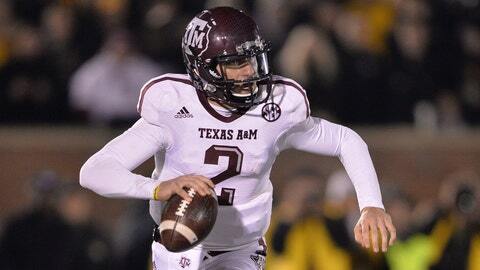 If Manziel can pull off the Heisman upset, he’d be just the second two-time winner. Ohio State running back Archie Griffin won the award in 1974 and 1975. Florida State freshman quarterback Jameis Winston, the odds-on favorite to win the award, heads the class of finalists. Alabama quarterback A.J. McCarron, Auburn running back Tre Mason, Boston College running back Andre Williams and Northern Illinois quarterback Jordan Lynch are also finalists.